Disclaimer: I’m very passionate about this parental control space. So many moving parts, many opinions, approaches and competitors trying to get parent’s attention to educate them about these amazing features. I recently wrote my third email to Apple’s CEO, Tim Cook in regards to this space and I’ve monitored the media reactions to Apple’s new Families landing page since it launched in early March 2018. I wanted to shed some light into the reality of this page and how Apple totally missed the mark on this one. What Apple shared mostly feels like a sales pitch to lock you into buying more Apple stuff, including an Apple Watch if you want your child to be more active (I have yet to see a child with one that looks like they are “active”… said it). Firstly, parent education is important and for many, what Apple created here may be good enough. iOS has become layered with more and more features over the years that putting together a “how to guide” focusing on parenting kids with iDevices makes sense. Secondly and most importantly, Apple doesn’t introduce anything new here. Lastly, iOS is nowhere near leading in parental controls – funny part is their own MacOS Parental Controls actually offer more than iOS… go figure. A big part of our blog is to do exactly this, educate parents on how to use technology with their families. Apple is the King of marketing spin – kudos. There’s NOTHING new feature-wise introduce in iOS here – all of this already exists. Requires different apps and features scattered around iOS to achieve some light level of parental controls. The majority of the features require your child’s iPhone in your hands (try that after your child’s had their device for a while!). There’s no way to remotely change any of these settings once set. 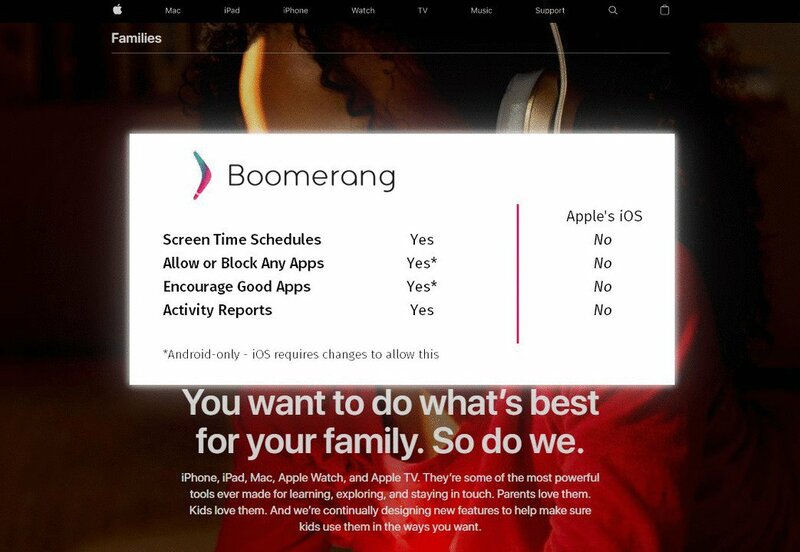 Apple hasn’t introduced anything new for third parties like us where we could help innovate parental controls on iOS with Boomerang Parental Control (hint: we do on Android). No reporting to the parents on kids’ usage activity, such as YouTube viewing/searching or per app usage (like we have on Android). Parents cannot monitor for inappropriate keywords in iMessages (like we have on texting on Android). There’s a free way to do this though if you have a spare iOS device or create another account on a MacOS computer. Learn How to monitor iMessages for free now. Zero screen time features introduced (MacOS has had Time limits for a while now but nothing on iOS). The Clock feature named Bedtime is not an enforced screen time feature. No central control except for new app approvals (a feature that’s been in iOS since Family sharing was introduced in iOS8, Sept 2014). I’ve personally used it and it was a pain in day to day use as I always had to enter my password. I’ll assume today it must be easier with the use of TouchID/FaceID. Did I mention Apple is great at “marketing spin”? This is such a deceiving screenshot – in fact it’s a lie… there are NO actual bedtime schedule enforcement here. This was the reaction to everyone I showed this page too – “Hey Apple has a bedtime schedule!” All the Clock’s Bedtime feature does is provide a local reminder to go to bed but it doesn’t lock, stop notifications from your child’s Snapchat streaks or enforce anything thus your child can keep using their iPhone at bedtime! In summary, I’m a big believer that Apple has some good pieces to combine in making a good option for iOS parental controls but have overlooked how fast moving this area has become. From home routers that can now monitor mixed home devices which includes non-iOS devices to the many parental control mobile apps now available in both the App Store and Google Play app stores. The ultimate solution will be when such features are built into the operating system and made available when your first set up your device. Maybe our user base will one day be valuable in making this happen. Let me know what your think and if you’re used these controls that Apple’s provided in their Families landing page.